This Thanksgiving, I followed my annual rituals as I visited my family in Cerritos, California. I picked up something for dessert, helped my mom in the kitchen, and listened to my dad’s stories. But this year, I was especially thankful that my family gets to celebrate an American holiday such as Thanksgiving. That’s because we are refugees from the Vietnam War, who were given the chance to forge a new life in the United States. As debate rages now about whether the United States should welcome Syrian refugees, I have this Thanksgiving hope: America will open its arms with compassion for those fleeing Syria just as it did forty years ago for Vietnamese refugees. I was born in Saigon, South Vietnam. There, my father was a judge and my parents had four children (with me being the youngest). 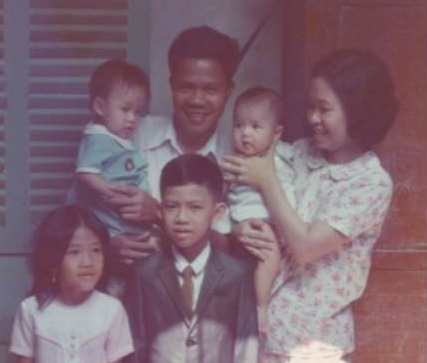 In April 1975, the night before Saigon fell to North Vietnamese communist forces, my family fled. Only 2 years old at the time, I have no memories of family’s escape. But luckily, my family did not have to be one of the 800,000 Vietnamese “boat people” who set out to sea in whatever boat they could find. The U.S. military helped evacuate some 125,000-140,000 Vietnamese people by planes and Navy ships; we were fortunate to be part of that group. After ultimately being brought to Camp Pendleton just north of San Diego, we were re-settled into Southern California with help from a church. My parents made it their mission to learn English, get jobs and work hard to provide opportunity for their children. Once the man who wielded justice from a court bench in Vietnam, my father got his first American job as an orderly in a nursing facility. My mother was a seamstress in a giant sewing factory. They both eventually landed into long tenures at the U.S. Postal Service — which they viewed as honorable because it was working for the government that gave their family a new life. They pushed their children to excel in education and forge career paths. I am a product of their determination, following my father’s footsteps into law — receiving a full scholarship to attend the University of Southern California Law School, rising to the ranks of partnership in major law firms, and now having a 20-year legal career in America. In many ways, my family’s journey epitomizes the mythic American Dream. The United States is a land of immigrants — beginning with the Pilgrims that inspired Thanksgiving — who come for freedom and opportunity. And that’s why the debate over Syrian refugees hits home for me. In the wake of the terrorist attacks in Paris and other parts of the world, I understand why some Americans are afraid. And I fully support the need to protect national security. But we cannot forget that much of our nation’s greatness was founded by compassion for refugee masses yearning to breathe free, and the hard work of immigrants like my parents. And we must remember that American values are rooted in diversity and tolerance — rather than religious litmus tests for who can or cannot come onto our soil. I wonder what would have happened to my family if the United States had not helped us. Would we even be alive? Would I have been blessed with a legal education and become a lawyer? Would I now have the same platform to write this piece and contribute my voice to America’s diversity dialogue? And what about the 1 million-plus other Vietnamese refugees who also came to the United States? What would have happened to them? There is an entire generation of doctors, lawyers, scientists, engineers, academics, teachers, business executives, and other talented citizens who made valuable contributions to American society — because the United States gave them new shelter after the chaos of war. Surely, there must be a way we can do the same for Syrians refugees — by achieving the dual goals of helping huddled masses in need while also protecting the security of our nation. I will leave it to the experts to figure out those details — but the Vietnamese refugee wave from the 1970s and 1980s is living proof that both goals are simultaneously achievable. As this land did for the Pilgrims, America offered my family the chance for a better future. I know many Syrian refugees would want the same.